We received a progress report on the cancer this week and can happily report that there’s been no progress! 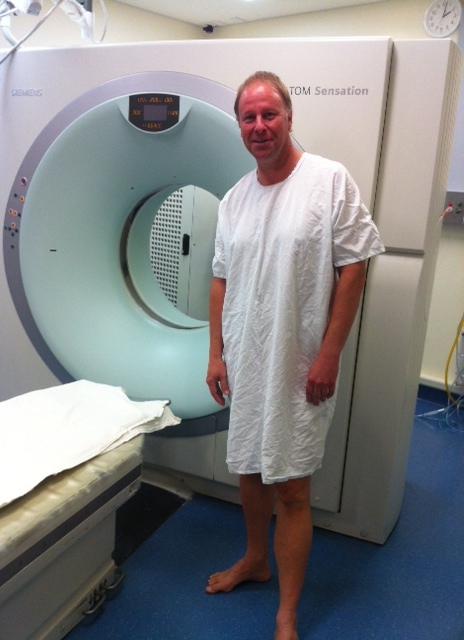 The CT scans revealed that the cancer hasn’t grown or spread in the past 11 weeks. Given that I didn’t receive any aggressive chemo during this period, this is good news. We’re smiling! 🙂 In fact, our oncologist was smiling too – very good news! 🙂 🙂 Thank you God! The plan is for me to go back on the Alimta/Avastin cocktail that I’d been on previously. We hope this will lead to the tumour shrinking even further. Preferably down to nothing! The dosage of Alimta will be reduced by 20% with the aim of keeping peripheral neuropathy at bay. I’ve also been prescribed some anti-depressants – not for depression – but because there is evidence that they may help prevent the development of neuropathy. For those of you who pray, could you please ask God for these three things: 1) that the chemo will be effective in destroying the cancer; 2) that the side effects of the chemo won’t be too harsh; and 3) that I won’t get further neuropathy. FANTASTIC NEWS!! Sparks are smiling and praying! Wonderful news! Continuing to pray for you and your family. Warm love from the US. amazing!praise God from whom all blessings flow! May God continue to reduce both cancer and side-effects! Thanks for the news Macca, see you soon. The Chengs. Fantastic news Dave! We will continue to pray for you. I am all down with the cancer destruction, no neuropathy plan! good news – but must say that the outfit isn’t as flattering as what you were wearing in the last few photos you have posted!!!!! So glad you got some good news! I had not realised what had happened after I left church, goodluck and takecare my friend. Dave, what an excellent bit of news to start my week – will keep praying. Praise God indeed. Great to hear the news. This household will hold up all your prayer requests daily. I have been thanking God that we can receive such news from you from afar, thanks to technology. Hugs and cheers. Greatly encouraged by this news, Dave! Also greatly encouraged by your faith. Previous Previous post: 50 not out – thank God!